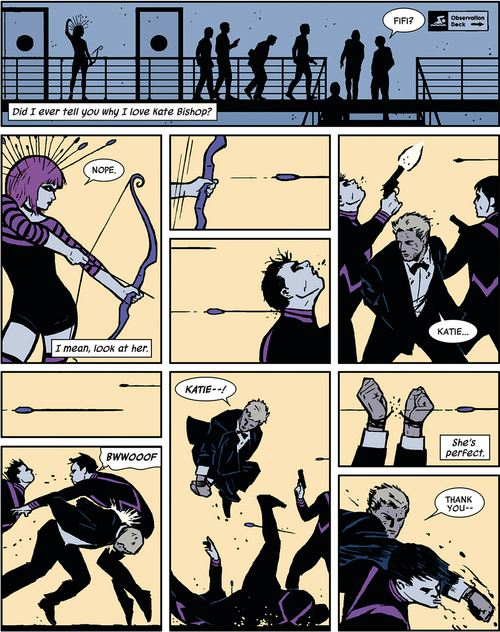 This David Aja page from 2012′s Hawkeye #2 provides a good example of art that, to it’s credit, could never quite be adapted into any other medium. I’ll be the first to admit it. It’s been great. It’s great to not avoid conversations about Captain America with people that don’t have a y chromosome. It’s great that my mom wanted to see The Avengers on Mother’s Day, and that the theater was packed, and that after it was over I could point at the screen and say “That’s what I’ve been so nuts about all my life.” It’s great that kids probably aren’t facing derision at school now for being into Iron Man. It’s great that summer blockbuster movies are now a lot less trite and stupid than they used to be. It’s great that characters from comics are now the center of the entertainment universe and it’s great that Stan Lee lived to see it. It’s great that the filmmakers started to take comics seriously. What’s not so great is that there’s a real danger that, now that these characters have become so famous that they’re more accurately described as properties, they have eclipsed the medium they were born in, are best in, and belong in the most. Comic books themselves are dangerously close to extinction. Comic conventions have been co-opted by film and television personalities and gone from the place a cult following of the faithful go for sanctuary and celebration to the focal point for studios to promote sequels, tie-ins, and merchandise. What for some is a lifestyle is for many a fad, and for still more it’s an opportunity to cash in. The funny thing about being a comic book fan is that you’re actually saying very little about a person when you call them that. Comic books are an entire medium. You might be a music fan or a movie fan or, one that clunks really hard since just about everyone watches sometimes, a TV fan. But those are all just laughably broad. For every variety of thing that you will see on television, there’s that many styles of comics. Some people like Honey Boo, some like Mad Men. Now admittedly, the majority of comic books from the last 50 years or so are based firmly in the superhero genre, and that’s what these movies are mining. Even so, there’s countless approaches to that aspect of the art form, and the truly devoted are the connoisseurs. My kind of fan doesn’t have favorite characters- they have favorite creators. Comic writers tell stories in a serialized format unlike any other in it’s scope and speed, and the true draftsmen and visionaries of comic art bring us work that can only be beheld on the printed page. The beauty of the layout, the way the panels compliment each other, there’s nothing else like it. Where actors and their agents insist that the masked characters they’re playing have to go without them for most of the movie (and on the poster and DVD covers), where unwieldy love stories have to be shoehorned in, where decades of a nuanced saga must be diluted into two snappy hours, the comics provide a mainline thrill to your brain through your eyes, by way of your imagination. 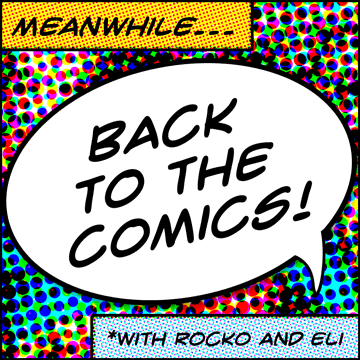 So I’m going to use “Back to the Comics” as a constant byline. Because we would lose a hell of a lot if we ever lost comics, and it’s going to be important to remember that in the years to come.